If you can’t find your iPhone right away by playing a sound, your next step should be to ensure that some other person who finds the phone can’t rummage around in your stuff. You do that by putting your iPhone into lost mode, which remotely locks the iPhone using the passcode that you set earlier. Display the My Devices list. Tap or click your iPhone in the list. Find My iPhone locates your iPhone on a map. Tap or click Lost Mode. 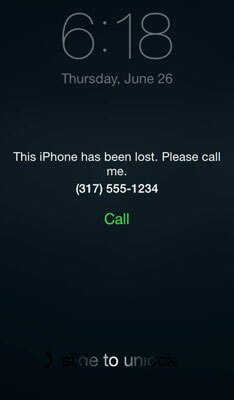 Find My iPhone displays the Lost Mode dialog, which prompts you for a phone number where you can be reached. Type your phone number and then click Next. Find My iPhone prompts you to type a message that will appear on the iPhone along with the phone number. Type the message and then tap or click Done. Find My iPhone remotely locks the iPhone and displays the message.